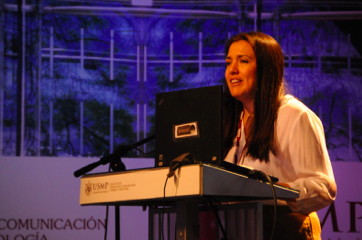 Recap: Patricia Bobadilla, professional adviser of the Peruvian Chapter of USMP, opened the meeting reminiscing about different public relations definitions created by well-known authors and practitioners. She concluded that the discipline has an advisory role of communications as a channel of relations between organizations and its publics using a strategic process. Bobadilla talked about the identity crisis of public relations in Peru. She said, “The profession as such is not well conceived, the lack of a homogenous theoretical body in the country and on the continent has led to confusion about, What is public relations? What does a public relation professional do? What is the background that a public relation professional should have?” The confusion stems from the fact that there is not a clear concept of these and there are not pre-established functions. Subsequently, Bobadilla showed a comparison of the professional training of communicators in Peru. Most universities that offer career courses are taught in Lima, denoting the centralism of practice and the study of public relations in the country. San Martin de Porres University provides 12 specialty courses in their five-year program. • A public relation professional must be able to communicate strategically. • All of us, as public relation professionals, must seek the positioning of the profession with ethical action. Dieter Tirado Núñez is a Public Relations and Communications student at San Martín de Porres University. In addition, he is a member of the social networking area and current CM of the Peruvian Chapter on Twitter. Great! Very proud of you Dieter, now i can understand what is this carrrer about.